July 25, 2012 - The Transportation Security Administration (TSA), in cooperation with the Association of Flight Attendants (AFA), the Association of Professional Flight Attendants (APFA), the Transport Workers Union (TWU) and Airlines for America (A4A), announced plans for the second phase of the industry's Known Crewmember (KCM) initiative, offering expedited security screening to verified flight attendants employed by U.S. based airlines. “We appreciate the recognition given to our professional flight attendants by the TSA Administrator. In addition to expediting the crew member screening process, we believe it will also assist in the flow of other passengers as they transition through the airport security lanes," said TWU International President James C. Little. “A4A has long advocated that as safety professionals, flight attendants should be included in the Known Crewmember program, and we are pleased to continue to partner with TSA on this risk-based screening system that improves safety, security and efficiency, benefiting both passengers and crew members," said A4A President Nicholas E. Calio. TSA anticipates that it could take up to 12 months for air carriers and their service providers to make the necessary system modifications and fully develop, test, and implement this change to the KCM program. 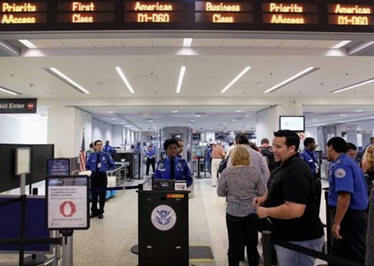 Flight attendants could begin to experience expedited screening as early as fall 2012. TSA will always incorporate random and unpredictable security measures throughout the airport screening process as no passenger is guaranteed expedited screening. TSA's multi-layered approach to security consists of more than 20 layers, including behavior detection officers, explosives-detection systems, baggage screening, canine teams, and federal air marshals, among other measures both seen and unseen.